Who knew? You! You knew that when there’s mention of Memory Lane in the Title Box, I’m so busy that I have decided I will recycle an old blog. But with 3000 in my archives, I don’t think you’ll mind. So here’s an oldie that’s a goldie. 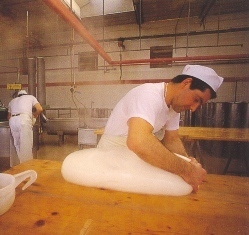 Some years ago I was sent these pictures of the Auricchio Cheese Factory in Napoli, Italy. 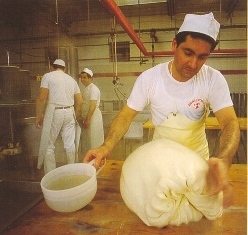 These are serious balls of fresh Provolone, being tended to by hand rather than machine. 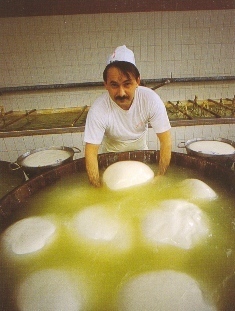 The big soft balls of cheese are taken out of the whey and shaped. The lumps of cheese are then formed into logs before continuing on their long journey to the dinner table. To my knowledge this company coagulates much of their milk, if not all, using a non-animal rennet.